This post doesn't have a lot to do with being a new mom, but it has everything to do with the person and parent that I am today. This year, my family saw a landmark anniversary of the day a doctor told my dad he had six months to live. In fact, it was fifteen years ago that my father went to have some unsightly blemishes on his back examined. The blemishes were found by a chiropractor who was giving my dad an adjustment following a snow shoveling injury. Turns out the unsightly blemishes were tumors. The doctor told my dad he had non-Hodgkin lymphoma and later (when they discovered the cancer had metastisized to his bone marrow) that he had six months to live. We had our family Christmas early that year as the grave prognosis indicated my dad wouldn't be around to see it if we waited until December. We visited my aunt in Kansas City for Spring Break so my dad could get a round of radiation treatment. We missed school to see grief counselors, go to classes about my dad's upcoming bone marrow transplant, and take what we thought would be our last family vacation. We celebrated the fifteen-year anniversary of this news this year. And my father was there to celebrate with us. They say denial is a coping mechanism that helps people with terminal illnesses to survive. Beat the odds. It must be true. My dad never "heard" anyone tell him he was going to die in six months. And so - he didn't. He didn't ever hear them say that he would never walk me down the aisle. 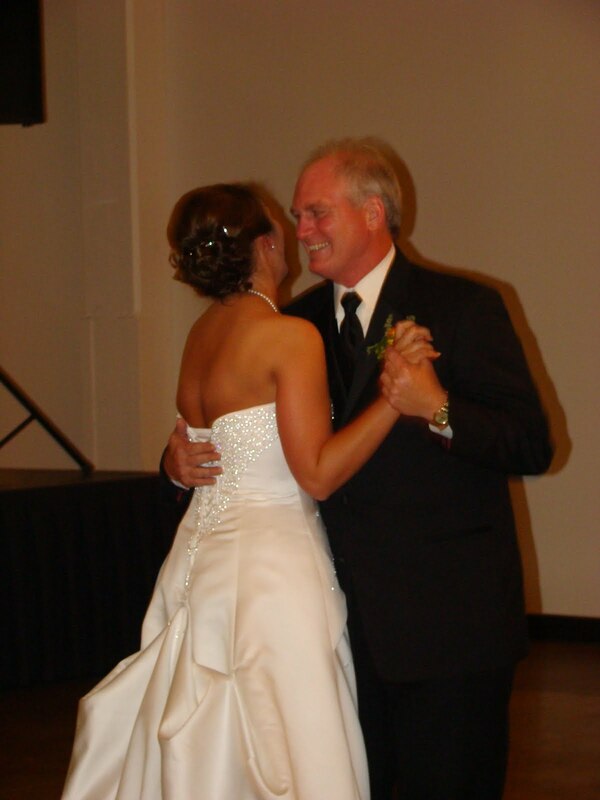 So, not only did he walk me down the aisle at my wedding - he danced with me at the reception too. I'm never sure how personal I want to get on this blog. Mostly, I want to entertain the few readers I have while also providing some (hopefully) helpful information about raising babies. But, you, my readers, should know it's been a tough couple of years to be a member of my family. And while the details of that are deeply personal and not fodder for this blog, I do want to say this. My father is a really brave and awesome man. Life has put him through the ringer. And we joke constantly that he's not on the first of his nine lives. That said, today's date has a special significance to the man I am proud to call "dad." The significance? Well, that's not my story to tell. Congrats on another year, dad. What a beautiful and inspiring story. Thanks for sharing. Beautiful post! You are so blessed to still have your father. June marked the 30th anniversary of my father's death from Pancreatic Cancer. Not a day goes by that I don't think of him. Gorgeous post...thanks so much for sharing and Congratulations to your dad and entire family!! *TEAR* Go super dad! Your dad definitely is one.